Rules and regulations for entering work into the Australian Shadows Awards are listed below. Please read this page carefully before submitting. Don’t hesitate to contact australianshadowsawards@gmail.com if you have any questions. Short Fiction: works up to 7,500 words. Long Fiction: works between 7,501 to 39,999 words (novelette or novella). Novel: works of at least 40,000 words. Collection: Three (3) or more short stories by a single author. No minimum or maximum word count. May contain reprints and/or originals*. Edited Publication: Three (3) or more short stories by two (2) or more authors; edited by one or more editors. No minimum or maximum word count. Includes anthologies and individual magazine issues. Horror/dark-themed special issues of mixed-genre magazines are also eligible. May contain reprints and/or originals*. Graphic Novels and Comics: Can include a single issue, run of issues, single comic or complete graphic novel. Work must be written by an Australasian. Work will be judged as an overall medium, with an emphasis on the script or story elements. Non-fiction: A piece of non-fiction or work of criticism, including (but not limited to) a book, essay, article or review. The work should be an author biography recognising work in the horror genre, criticism of one or more horror works, or be based on a topic that is in some way horror-themed, ie. hauntings, true crime killings. Poetry: Up to three (3) pieces per author. No line limit. * Reprint-only collections/edited publications are eligible in the year the work as a whole is first published. Subsequent editions (in any format) or the publication of a new edition by a different publisher are ineligible unless different stories are included. As of December 2018, authors can only submit up to three (3) submissions per category, across all categories of the Australian Awards Awards. As of 2017, there is no fee to submit works to the Australian Shadows Awards. All entries must be first published within the calendar year of consideration (i.e. 2018 for the 2018 Awards). In the case of work translated from another language, eligibility will be determined by the year of first publication in English. The work may be published in any text format: print, electronic, or audio. The work may be traditionally published or self-published. The author/editor must be a citizen or permanent resident of Australasia, New Zealand, or Oceania (hereafter referred to as ‘Australasia’ for convenience). In the case of collaborations, works co-written with or co-edited by a non-Australasian are eligible (although only the Australasian collaborator may claim prizes if that work wins). 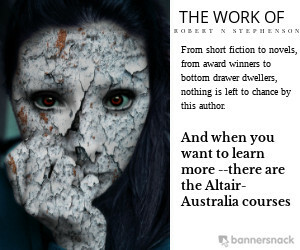 The work must have horror/dark fiction content either as a focal point or an integral element of the work, that is the intent of the work must be to disturb or inspire fear in the reader. Eligible genres/sub-genres include horror, dark fiction, dark fantasy, and paranormal fiction. In the case of anthologies and collections, some mixed genre stories may be allowed, but the predominant genre/theme of the anthology/collection must be horror. The Awards Coordinator has the discretion to rule ineligible any work based if the work is not considered dark/horrific enough. Eligible works may be nominated from midnight Monday 24th December 2018 through to midnight Thursday 28 February 2019. In an effort to include an awards ceremony hosted at Continuum, the reading period will run until 1 May 2019, at which point the judging panels will consider shortlists in each category. Shortlists will be announced in late May and winners will be announced at Continuum on the second weekend of June. All submissions should be made to the Shadows Awards Coordinator at australianshadowsawards@gmail.com. Only three submissions allowed per author across all categories. Submissions should be made by the author, publisher or their agent or representative, with the appropriate category determined based on word count or content. Required information for each submission includes author name/s, publisher, word count, award category. Submission of electronic works is preferred (epub, mobi or PDF), attached or linked to from the submission email. Where electronic versions of works are not available, works should be posted to the judging panel within 14 days of submission. The Awards Coordinator will advise the author/publisher of the judging panel’s postal addresses if required. A panel of not less than three (3) judges (referred to as the judging panel) will read all entered material to determine a shortlist of five (5) works in each category as finalists. Judges are encouraged to serve a two-year consecutive tenure. After two years, it is recommended that the judge step aside to allow new judges to serve. This ensures no one individual’s opinion will dominate finalist selections. If an award category receives less than ten (10) entries, the judging panel has the discretion to reduce the number of shortlisted finalists to three (3) or to announce a ‘No Award’ for that category. If the judging panel concludes that entered works in any category are of insufficient quality to be considered award-worthy, they may announce a ‘No Award’ for that category, regardless of how many works were entered in that category. The winners in each category will win an Australian Shadows Awards trophy.